Dharamsala, INDIA - It is unfortunate that the Central Tibetan Administration (CTA) and my name have been dragged into internal matters related to the Tibetan Service of Radio Free Asia (RFA). 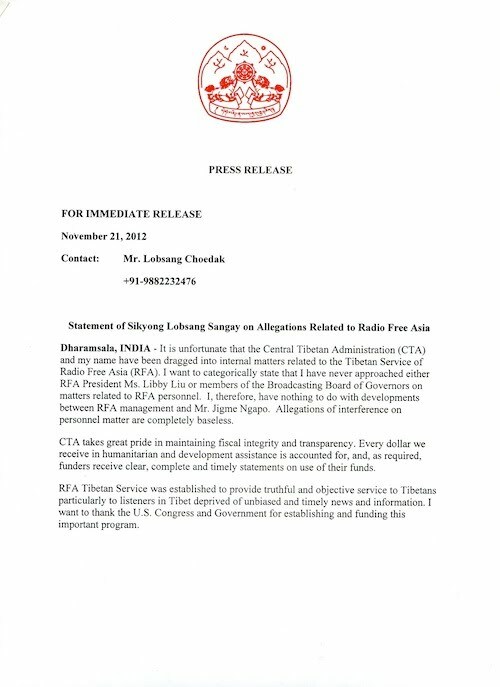 I want to categorically state that I have never approached either RFA President Ms. Libby Liu or members of the Broadcasting Board of Governors on matters related to RFA personnel. I, therefore, have nothing to do with developments between RFA management and Mr. Jigme Ngapo. Allegations of interference on personnel matter are completely baseless. CTA takes great pride in maintaining fiscal integrity and transparency. Every dollar we receive in humanitarian and development assistance is accounted for, and, as required, funders receive clear, complete and timely statements on use of their funds. RFA Tibetan Service was established to provide truthful and objective service to Tibetans particularly to listeners in Tibet deprived of unbiased and timely news and information. I want to thank the U.S. Congress and Government for establishing and funding this important program.